VietPress USA (July 13, 2018): On July 10, 2018, AP reported that "With Europe's wary eyes upon him, President Donald Trump launched a weeklong trip there on Tuesday with harsh criticism for NATO allies and predicted the "easiest" leg of his journey would be his scheduled sit-down with Russian President Vladimir Putin. Trump said Tuesday he "can't say right now" if Putin is a friend or foe, but called him a "competitor." The U.S. intelligence community has concluded that Russia interfered in the 2016 election to boost Trump's candidacy, and warns of further attempts at interference both in the 2018 midterms and in European elections." Trump always denied that he, his association, his people or his campaign had any collusion with Russia in meddling the 2016 Election to help Trump's victory. 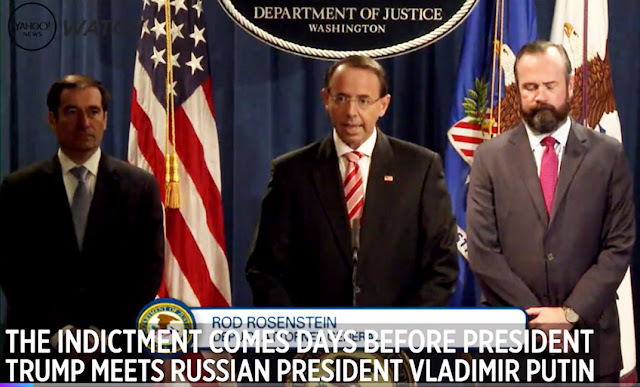 But today, Deputy Attorney General Rod Rosenstein at a press conference had declared 29 pages of Russian indictment for meddling the U.S. Election 2016 to ruin Hillary Clinton and to support Trump. With this indictment, how President Trump can praise Vladimir Putin is better than NATO allies.